A traditional melt-and-mix gingerbread recipe. Dead easy. Grease and line a 10“/ 25cm square deep sided cake tin, with greased greaseproof paper (though I have baked in two loaf tins and still had great results). Melt together the treacle, sugar and butter stirring all the time. Remove from the heat cool a little and then stir in the beaten eggs. Sieve the flour, salt, cinnamon and ginger and stir into the melted mixture. Sieve the bicarbonate into a bowl and pour the warm milk over it. Add this to the treacle mixture, stirring well to combine all ingredients. Pour into the prepared tin and bake at 150°C/300°F/gas 2 for 1-1½ hours. Test with a skewer which should come out clean when inserted into the middle of the cake. 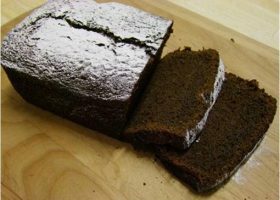 Allow the gingerbread to cool before removing it from the tin and removing greaseproof paper. Cut into thick slices to serve.